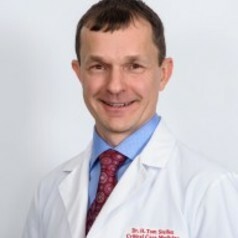 Dr. H. Tom Stelfox is Professor of Critical Care Medicine, Medicine and Community Health Sciences at the University of Calgary. He is the Senior Medical Director for Alberta Health Services’ Critical Care Strategic Clinical Network and Deputy Head of the Department of Critical Care Medicine at the University of Calgary. He received his M.D. from the University of Alberta, Internal Medicine Residency at the University of Toronto, Ph.D. in Health Care Policy at Harvard University and Critical Care Fellowship at the Massachusetts General Hospital. His research program focuses on the application of health services research methods to evaluate and improve the quality of health care delivery to critically ill patients. His research activities include developing quality indicators; developing strategies to improve continuity of patient care across the care continuum; and improving the translation of scientific evidence into clinical practice.